Magic Hat is no slouch at making good beers. Click here for a review of their #9 beer as well as my thoughts on Vermont. So I wasn't surprised that I also really enjoyed their Wacko summer seasonal ale. Wacko is only available April 1 to July 31 (I'm not sure what calendar they are using, but it is clearly not summer until after Memorial Day weekend, duh), so get it while you can. I'm not sure if they pull it from the shelves on July 31, or if you'll be able to find it collecting dust at some dingy mini-mart on some dingy street corner in some dingy town somewhere come September, but I wouldn't wait to find out, because Wacko is a delicious beer that should be consumed if at all possible. I really liked this beer for many reasons, one being because it tasted like something I would drink at breakfast. You know, like at a tailgate or if you are on vacation at the beach in the summer, and you need to start your day out right. It has a very light crisp taste and goes down really easy, so you could drink 50 of these in a day no problem, especially if you start at breakfast. I also liked this beer because it is pink. Yes it is pink it color. It looks almost like cherry 7-UP. The secret to the pink color is that Magic Hat adds beet juice to the beer. Don't like beet juice you say? Well, I only tolerate it myself, as it tastes like terra firma to me. But beet juice is a magical blend of nutrients and nitrates that could lower blood pressure. So even if adding beet juice to beer can make your blood pressure go down by 30-70 points, you won't taste it - the beet juice seems to be for color only and goes unnoticed by your taste buds. 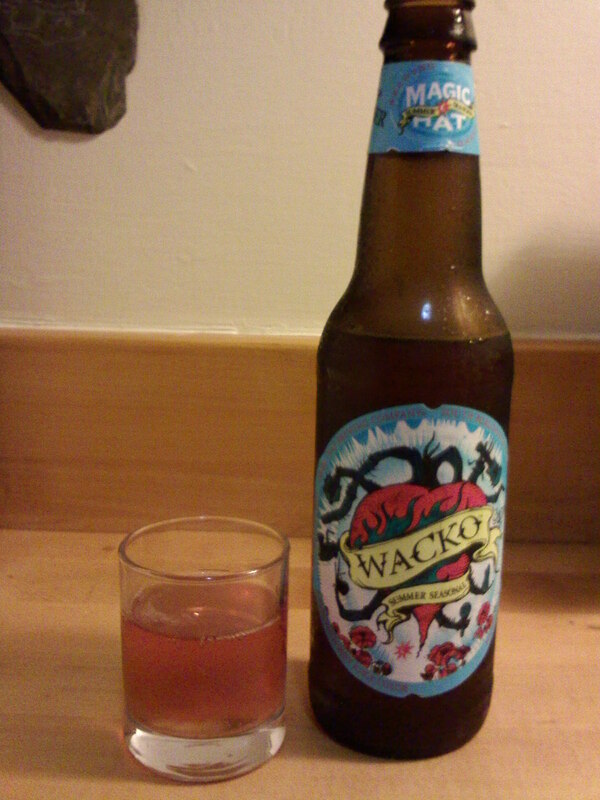 Wacko runs at a paltry 4.5% ABV, and at $9 a six-pack, you can do much better in the ABV/$ category. Magic Hat recently took a hit in the Curb Appeal department. If you've been watching the NBA Finals, you have been subjected to tons of TGI Fridays commercials advertising that they will give you a $10 gift certificate for your next visit (assuming you live to go to TGI Fridays again). During this commercial, they proudly declare that they serve Magic Hat beers. Now, I'm not totally against the idea that Magic Hat is served at TGI Fridays, but they totally sold out! Let's celebrate by watching and listening to some late 90s ska music. To recap - this pink beer tastes great, is easy to drink, and may improve your cardiovascular health (this statement is not approved by the FDA). Buy it for its taste and drinkability, don't buy it for its value and its curb appeal. Pink beer!!!!!!!!!!!!!!!!!!!!!!!!!!!!! !